Modern nurseries are clean, cool and totally fabulous! That being said, I consistently get one design note from my clients. “How do we bring warmth into a modern nursery?” My go-to design rule is to balance out the very modern with something that has a lot of character and texture. Rustic or reclaimed elements add contrast to the smooth look of modern pieces and help create a beautiful visual harmony. 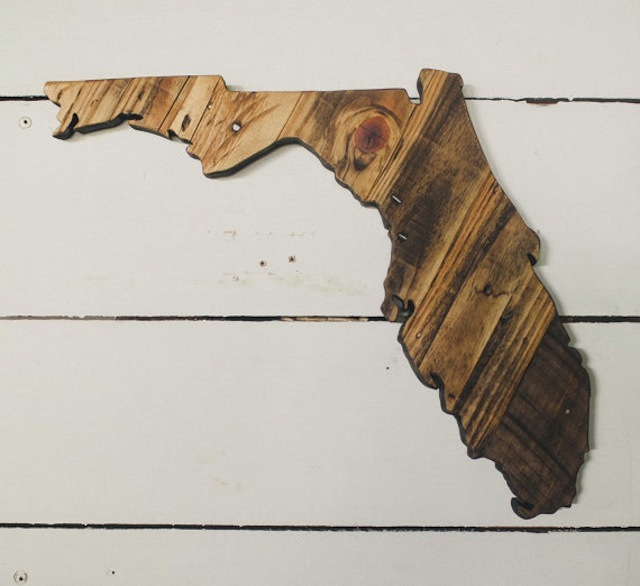 A custom made wall plaque in the shape of your state would add the perfect subtle personalization to your space. I’d love to see Hawaii! We might not all have the time (or skill) to piece together a reclaimed wall of wood, but this clever wallpaper (YES, wallpaper!) creates a radically rustic statement that adds instant character to an otherwise bland space. I love mixing something very rustic with something very modern—the contrast can be so chic. Similar styles are available in a variety of colorways. I love a faux bois—always have, always will. The elegant, flowing lines of woodgrain have become a new modern classic. This gorgeous blanket is reversible, and the gray and brown make for a very cozy statement. It’s the perfect, functional accessory to add a woodland touch that you’ll actually want to touch! Give me an “A!” This oversized reclaimed wood letter would make a great statement alone or mixed within a gallery style composition. It’s totally customizable and handmade! I love that this hand painted shelf seamlessly mixes two of Project Nursery’s top trends for 2014—arrows and rustic/cabin decor. This piece is as functional as it is adorable. It’s the perfect spot for a special keepsake, or you could place it near the changing table as an extra surface for supplies. How have you added warmth to your modern nursery with rustic touches? You are so on trend Sam! Rustic is absolutely a big 2014 nursery trend. Thanks for the great post!